Until relatively recently, Mercury was one of the most poorly understood planets in the inner solar system. The MESSENGER mission to Mercury, is changing all of the that. New results from the Mercury Laser Altimeter (MLA) and gravity measurements are showing us that the planet closest to our sun is thin skinned and wrinkled, which is very different from what we originally thought. The MErcury Surface, Space ENvironment, GEochemistry, and Ranging (MESSENGER) spacecraft was launched back in 2004. It took a long time getting to its destination, completing 3 flybys of Mercury before finally entering orbit a little over a year ago. Currently, the spacecraft is in a highly eccentric polar orbit, approaching the planet much closer in the north than in the south. This allows the northern hemisphere to be probed and imaged at enviably high resolutions, but leaves the southern hemisphere poorly understood. Even so, the data returned from MESSENGER is showing us some quite unanticipated findings. Two papers from the MESSENGER team, published in today’s issue of Science, are showing some surprising results from the laser altimeter and gravity experiments. Using NASA’s Deep Space Network, Earth-based radio tracking of MESSENGER has allowed minute changes in the spacecraft’s orbit to be monitored and recorded. From this, Dr. Maria Zuber of MIT and her team calculated a model of Mercury’s gravity. Meanwhile, the on-board laser altimeter has provided invaluable topographic information. Combined together, these data have allowed the MESSENGER team to glean a great deal of information about the planet’s interior workings. One of the most striking findings is that the iron-rich core of Mercury is very large. A combination of measurements and models suggest that the core has both a solid interior portion and a liquid outer portion. And while it is not certain how much of the core is solid and how much is liquid, it is clear that the total core has a radius of about 2030 km. This is a huge core, representing 83% of Mercury’s 2440 km radius! The internal structure of Mercury is very different from that of the Earth. The core is a much larger part of the whole planet in Mercury and it also has a solid iron-sulfur cover. As a result, the mantle and crust on Mercury are much thinner than on the Earth. Furthermore, these calculations suggest that the layer above the core is much denser than previously expected. Results from MESSENGER’s X-Ray spectrometer indicate that the crust, and by extension the mantle, are too low in iron to explain this high density. Dr. Zuber’s team think that the only way to explain this discrepancy is by the presence of a solid iron-sulfur layer just above the core. Such a layer could be anywhere from 20 to 200 km thick, leaving only a very thin crust and mantle at the top. This kind of interior structure is completely different from what was originally suggested for Mercury, and it is nothing like what we have seen in the other planets! This striking fact may help explain some unexpected altimeter results, which show that Mercury’s topography has less variation than other planets. The total difference between the highest and lowest elevations on Mercury is only 9.85 km. Meanwhile, the Moon has a total difference of 19.9 km between its highest and lowest points, and on Mars this difference is 30 km. Dr. Zuber and her team speculate that the presence of the core so close to the surface could keep the mantle hot, allowing topographic features to relax. In such a scenario, the lithosphere under tall impact-formed mountains would sink down into a mushy mantle that cannot support their weight. Conversely, the thin lithosphere under impact basins would rebound upwards, taking part of the mobile mantle with it. In fact, the gravity data shows evidence of exactly this kind of process, in the form of “mascons”. These mass concentrations form when large imacts make the local crust very thin, allowing denser mantle material to rise closer to the surface as the lithosphere rebounds from the impact event. 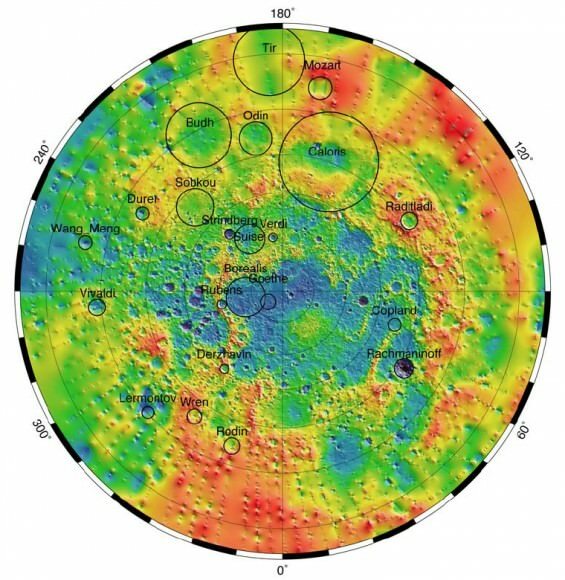 Mascons are well known from studies on the Moon and Mars, and now MESSENGER’s gravity data has revealed three such mascons on Mercury, located in the Caloris, Sobkou, and Budh basins. The elliptical polar orbit of the MESSENGER spacecraft means that measurements at the North Pole of Mercury are much better than those at the South Pole, or even at the equator. This is evident in the better spatial resolution that can be seen at the high latitudes in this elevation map of the northern hemisphere. Major impact structures are identified by black circles. Interestingly enough, the mascons in Sobkou and Budh basins are not immediately obvious. They only show up when the effects of a regional topographic high are adjusted for. This topographic feature is a large quasi-linear rise that extends over half the circumference of Mercury in the mid-latitudes. The rise even passes through the northern part Caloris basin (which is large enough that its mascon is not overwhelmed by the rise). Studies of this rise by the MESSENGER team suggest that it is relatively young, having formed well after the formation of the basins, after the volcanic flooding of their interiors and exteriors, and even after some of the later impact craters that cover the flooded surfaces. Dr. Zuber and her team also identified another young topographically elevated region, the Northern Rise, located in the lowlands surrounding the North Pole. They speculate that these young rises represent a buckling of the lithosphere, which happened when the planet’s interior cooled and contracted. This interpretation is supported by the presence of lobate scarps and ridges that can be seen around the planet, and which represent faulting of the crust when it was compressed. So, it seems that Mercury is unlike the other planets of the Solar System. It appears to have a disproportionately large core that is covered by a thin skin of mantle and lithosphere. Furthermore, this skin seems to have wrinkled like a raisin’s when the huge core of the planet shrunk as it cooled. Brilliant, brilliant article, Irene. UT reaches another higher zenith in quality! Who needs to read the News Notes in S&T! Well done! Explaining the evolution of Mercury since our Solar System formation will be the next step in our knowledge. It is good to see a planet historically deemed as boring provide such detail! I wonder how much tidal influence there is on topography and structure generally. I suppose the tidal locking has removed any heating effects. And congrats on UT for getting the readability of Antonenko’s articles fixed, re the earlier large comment fonts. As Mercury, they now show off the influence of the deeper core. NICE! Thanks for the update Dr. Antonenko… We knew that the Messenger mission would turn up some surprises and have not been disappointed! What next? an active volcano or two? One thing that is very cool is that the ESA is going to follow up with a mission to mercury in 2015 (launch). So if we will be able to target some of the mysteries Messenger finds. In frame of one view, that spells-out to me: this SolarWind-blasted hulk of a contracted world, trapped in the Sun’s infernal embrace, was once a lager Planet, and probably orbited in a different, more favorable location (with associated System reconfiguration – but Earth still stabilized in Life-centered Habitable Zone). Now, its like an iron-laden Mummy: the long-dead, shriveled – and unsightly – remains of a “livelier” past, now mist shrouded. – “They speculate that these young rises represent a buckling of the lithosphere, which happened when the planet’s interior cooled and contracted.” / Do cold, ice-locked Mars, and this Sun-blasted furnace, have some commonality, after all? Two fossilized worlds, on either end of the bright Terrestrial Realm, both shrunken shadows of their former selves (abandoned by moon-companions)? For me, reading through this article, was like gazing through a precision-crafted telescope of superb optics! In my mind, it focused a world’s broadened view, and magnified its detailed images, just as sharp! Outstanding – as I step away from the eye-piece, with vivid images of a strange world interior, and its intriguing, fiercely desolate, surface exterior. Worlds turn into view, mysteries endless to pursue. Next PostNext Intelligent Alien Dinosaurs?